Old scary movies are full of haunted houses and even haunted house parties (see House on Haunted Hill). Create your own haunted house party this Halloween! With these Halloween decorations and some creativity, you’ll have your guests screaming with the fun! Haunted houses are also great fundraisers. Charge a small admission price to cover costs and earn a small profit on each ticket for your team or organization. Start creating your haunted house outside with haunted house caution tape. Block off areas with it to create an ominous feeling or use it to outline the walkway to the entrance. Set up a skull crypt door set on the door for a really freaky look or use a Dracula door knocker for a frightening entrance. Put someone in charge of a classic special effect at the entrance. Have someone hide behind the door in the darkness. When guest knock, they’ll open the door, remaining hidden so it looks like the door opened by itself. You can also use Halloween door curtains in other doorways to section off the haunted house into other creepy rooms. Use a personalized haunted house banner to announce your haunted house event or welcome guests to the party. These vinyl banners are printed on heavy-duty, weather-resistant material and come in seven sizes to suit your needs. Now that’s something to scream about! 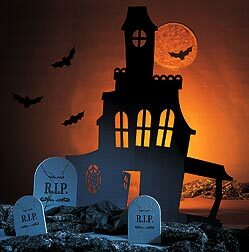 Make a big impression with a Haunted House Decorations Kit. Set up the haunted house silhouette and the hanging bats for an eerie look to kick off your haunted house fun. Decorate the rest of your party space with creepy accents like a freestanding mummy, wrapped in creepy cloths. Our scene setters are perfect for covering your walls. Put up graveyard raiders, tombstone terror, or scary scene setters to add frightening accents to each room. You can even put a grim reaper ceiling grabber above your guests’ heads to add an extra dimension of fright. 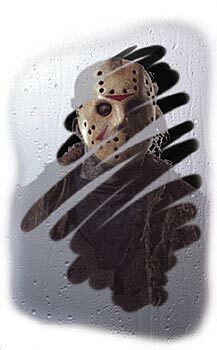 If you have mirrors or glass around a room, try a Friday the 13th mirror grabber for a chilling effect. Add more, subtle touches to your decorating with accents like a (plastic) severed leg for placing in frightening locations for guests to accidentally find. Fake black cats will look great in corners or on shelves. Set up a collapsible coffin in a basement room, warning guests about the vampires or zombies. 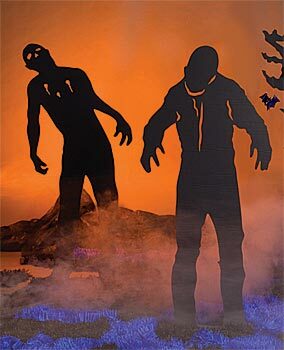 Zombie standees are a great touch. Around the coffin, use a tombstone decorating kit or bag-o-bones to add an extra element of realism to the scene. Our mini 3-D bats are great for hanging in a dark room along with a night-glow skeleton. Add special effects to your decorations too. Hang cobwebs all over, especially in places where guests will run into them. Fill the haunted house with fog from a fog machine, to create an eerie mist that will add to the terror. A lighted spider web with a moving spider will really freak out arachnophobes or startle other guests. Set the bloody butcher heart, which actually moves with a heart beat, on the kitchen counter next to a plastic meat cleaver or other utensil. Have a Creep Show CD playing for scary background noises. Lighting effects are another great way to add a spooky impact to your haunted house. Use a black light to give the room an eerie glow or a spinning skull strobe light to create uncertainty and weird movement in another space. Some flashing bat lights and spider web lights are great for stringing along banisters and other surfaces. The fiery décor, including table torches and fiery pots are great for creating a dungeon. There are all sorts of creative things you can do to make your haunted house scary and fun. Come up with your own ideas to frighten guests, or use these classics. Have volunteers dress in black or in scary Halloween costumes to jump out at guests to startle them. Just make sure they don’t touch the guests! Time special effects or have someone (dressed in black so they’ll be hard to see) in charge of setting them off as guests enter the room. If you have a strobe light, try setting it off after guests are already in the dark room. It will make them jump nearly out of their skin! Have a fun and creepy game. Put food or objects in bowls behind a curtain, have guests feel in and guess what they are. Then, tell them that they have their hand in something gross such as worms (cooked noodles), brains (pasta salad), eye balls (peeled grapes), fingers (baby carrots), etc. Hosting a haunted house party or fundraising event can be as much fun to plan as it will be for your guests to attend! This entry was posted on July 25, 2007 at 9:01 AM	and is filed under Halloween Decorations, Party Tips. Tagged: Halloween Decorations, Haunted House Decorations, Haunted House Party, Party Tips. You can follow any responses to this entry through the RSS 2.0 feed. You can leave a response, or trackback from your own site. I’m looking for a haunted house game I played 50yrs ago. There was a story told as we were blindfolded. Grapes for eye balls noodles jello ect. any help would be great…It’s for my grand-daughters 8th birthday. great idea we di that and it turned out amazing!